Many people have asked me to make a combo/orb matching guide and your voices have been heard! Perhaps this will be the first in a series of videos dedicated to orb matching techniques. I am well aware that other notable community members have created helpful videos and I wish to try and something different by incorporating both a written and video guide to help convey my thoughts. Just keep in mind that every player has their own orb matching playstyle and my techniques are based from my own experience and opinions. There are many ways to tackle a board and I simply wish to share my own knowledge to hopefully improve your own puzzling skills. As this is a guide on how to improve your matching skills, a large component will be done via video format but I will do my best to incorporate screenshots below for the various techniques I wish to highlight. A skilled player will utilize these formations to varying degrees and although you may not be able to use all of them every turn, it is wise to at least be aware of how they work and incorporate them as needed. These will take time to master and you may wish to spend time in Endless Corridors practicing until they become second nature. Cascades are used to help form matches that would be impractical due to spacing issues or to ensure you do not break up already formed combos. In addition, every time you Cascade, you increase your chances of a Skyfall match occurring as orbs are falling down at a staggered rate and this increases the odds you will trigger matches on already existing orbs. If we follow our Chess analogy, you want to become the Queen/King. 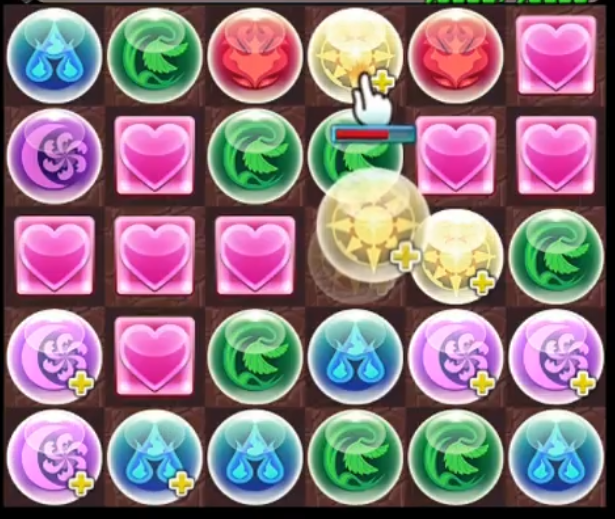 If you look closely at the above board, you will notice that the dark orbs will match and cause the water to fall into place near the bottom (Elevator) to trigger an additional combo. 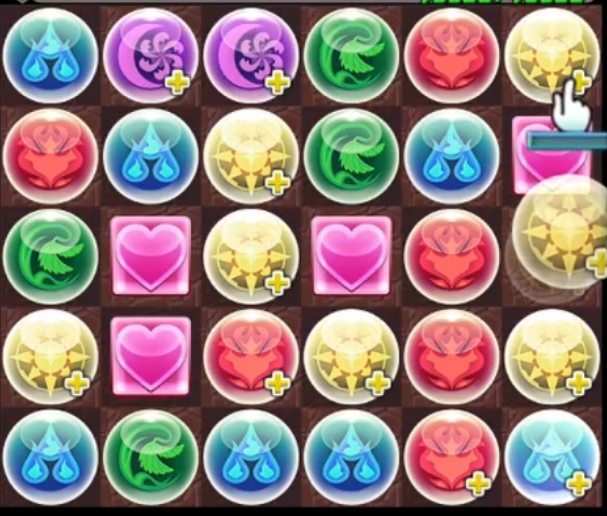 However, the two heart orbs near the top to the right of the dark match have two chances to match via skyfall. The first occurs when the dark orbs are matched as 3 new orbs take their place. If that did not match, you gain a second chance as the water orbs are removed as a new orb will fall down. If either of those were hearts, you just manufactured a skyfall, but had double the chances due to your cascade. Before you start practicing cascading, you should learn how to do diagonal movements. Diagonal movements are done by moving your orb at a 45 degree angle instead of the easier left, right, up, and down (you can also think of diagonals as a Bishop movement from Chess instead of the Rook/Castle). Diagonals are vital to your puzzling skills as they allow you to make matches that you could not otherwise along with being faster as it requires less movement. With one simple movement, you move the heart orb towards the water in the top right corner. This is faster than going right then up. Furthermore, if you had preexisting combos already set up around your starting position, you may break them up by going via a non-diagonal route. Diagonals take practice to master and are partially a confidence issue as many players are afraid to take the extra risk (as a flubbed diagonal requires additional time to correct) in challenging content. Thus, I strongly encourage you to practice in Endless Corridors until you feel comfortable with diagonal movements. The Line is perhaps the simplest cascade to form as it is relatively straight forward along with being somewhat instrumental when playing heart-cross leaders. In essence, you trigger a horizontal match which results in the above orbs to drop down and trigger an additional combo with the orbs below the originally matched line. From the above image, the horizontal heart orb match will result in a wood and light combo to occur. The line is relatively simple to set up and will be your most common method of Cascading. For those who play heart-cross leaders, being able to see a line Cascade can be vital planning out your matches as it will allow you to utilize space that would otherwise be inaccessible. The Staircase is one of my favourite methods for forming combos as it allows for some unique orb manipulations and patterns. In essence, the staircase works from the bottom-up as you will be forming matches on the bottom row and causing orbs to cascade into place beside/above the original combo. 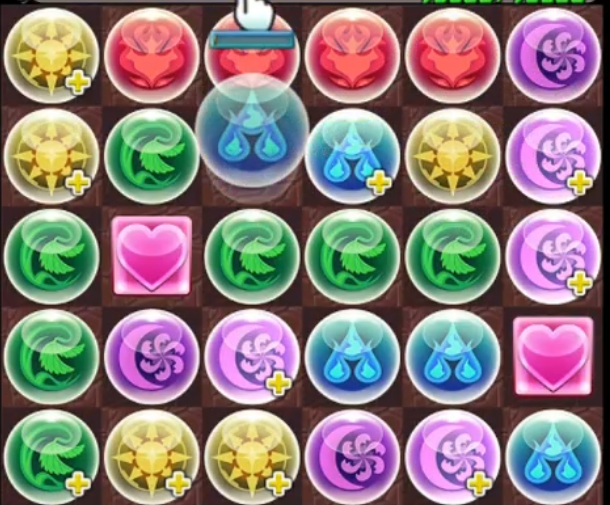 No other combo will trigger until the four light orbs at the bottom are matched. This will then result in a dark, wood, and water combo and then a horizontal 3 of heart orbs on the left after the dark orbs are removed. This is also a great way to utilize board space when matching TPA combos. These take time to plan out, but can result in numerous skyfall matches as you increase the number of Staircase Cascades formed. There is no rule that prevents you from combing two or more cascade methods and it will help you achieve a higher chance of skyfall as your matches occur in a staggered manner. The Elevator is the third and final formation used for forming Cascades and can be the trickiest to set up/visualize. The Elevator has you form a three or four match in a vertical manner that will disappear and then drop down a specific orb to match down below. By utilizing multiple Cascade elements, you are able promote the chance of Skyfalls occurring as well as better optimizing your board. The above image showcases a heart-cross which results in a Line Cascade of dark which then delivers the water orbs via Elevator to trigger a Staircase at the bottom. Granted this may not be a practical combo for everyday puzzling, but is well worth noting the potential. Fully optimizing a board is a term used to describe how you would match a board by producing the maximum number of combos it has available. 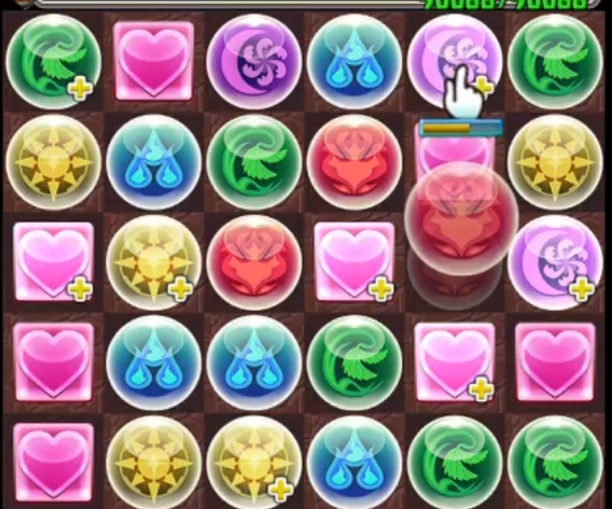 On a 6×5 board, you are able to form up to 10 combos with a perfect orb distribution; however, this will rarely come true. Thankfully, by using Cascades, you help promote additional Skyfall matches as your orbs are removed in a staggered manner. 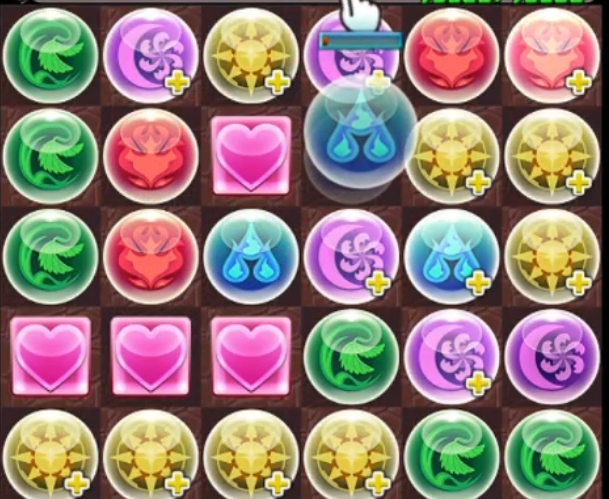 This Elevator/Staircase board makes the maximum number of possible combos available (7), but has the orbs removed at different times which did result in a 9 combo match. Cascades are not guaranteed to produce Skyfalls, but significantly help with their formation. Cascades are a fun way to trigger additional combos while promoting the chances of a Skyfall to occur. They take a significant amount of practice to master, but are well worth the effort as you will be able to generate combos that would have otherwise been accessible as well as better using your board. Let me know what techniques you use to Cascade your orbs and how long did you practice making diagonals. Great guide, as usual ;). Also, I seem to recall TylerPAD saying that the Line cascade is the toughest to pull off. It’s always interesting to see how people’s play styles differ. PS I did not mean to be disrespectful or argumentative with the comment about TylerPAD, it was purely a conversation point and I apologize if it seems to be rude. That’s why I put the disclaimer at the top of my post, everyone differs in visualization and matching tendencies XD What may be easy for me to see/perform may be challenging for others and is partially why I try to showcase as many different patterns. And don’t worry, I never thought it was rude! (Unless I missed it) You should note that certain types of cascades can risk in combos being broken: This is particularly notorious for TPA/5match and cascading most Crosses. I LOVE cascading but it definitely can be very difficult to optimize–half the time I do it it’s to boost my very small ego and it didn’t really help increase combo count. It’s important to realize that sometimes the board handed to you will lend itself naturally to a solution that has NO cascades, and that is okay. Forcing cascades is just as bad as forcing a perfect 3 – 3 – 3 – 3 etc setup. I do agree that it could be risky at times! You dont always have to go for the cascade, but it is worth know how to along with being able to spot the patterns at will. Something I was actually hoping to see here was setting up cascade crosses. It’s sometimes more practical on heart-heavy bi/tri-color boards to try and make the cross via cascade in order to make a row (or 2) of your desired color…yet it’s a lot trickier than a typical match. Cascading a Cross, TPA, 50e1 can be dodgy as you run the risk of matching too many orbs and thus producing the wrong match. I thought I was very interesting and will be trying to use a lot of what I just saw to further my gaming. I’m coming up on 275 days now and still have a lot to learn. But thank you for that tutorial and I will be looking for mare. Ok… now u give me something to rack my brain at the weekend. As I told you earlier, I found awesome but very difficult to achieve when mixing with heart cross. I’ll try later with my row leader. I have seen you doing a lot of third row using cascade with Sarasvati and Blonia. This person is very good at cascades. I am not sure if I can comment this. Please delete it if this is not allowed. And then you yell out Huzzah!